Great color choices! I have this quilt on my to-do-someday list and having alternative cutting directions will be very helpful, thanks!! This is really pretty. Love the fabric choices. Love your version, it's gorgeous and the illusion is fascinating! Love the size of yours, too! As ever Kelly it's lovely. This has now gone on my " to do" list and I will use your directions and brights!!! That is such an interesting and fun pattern! Thanks for the cutting directions, it helps a lot! Lovely quilt! This is on my bucket list. Very pretty! Thanks for the cutting diagrams - I'll save for a rainy day. This is adorable, I would Love to make one thank~you for including the cutting instructions. Now to figure out how to shorten it up. Twin size is to big for what I want to do with it, but I just love it, such an illusion! Really cool! I have several layer cakes and I have a bunch of FQ, but I never have the matching jelly rolls. I might have to give this a try. great tutorial -- I greatly appreciate it esp considering I never buy jelly rolls and have been looking to start a project like this one. I love it! Thanks for the instructions, I've put off trying this pattern as I dont buy pre-cuts. 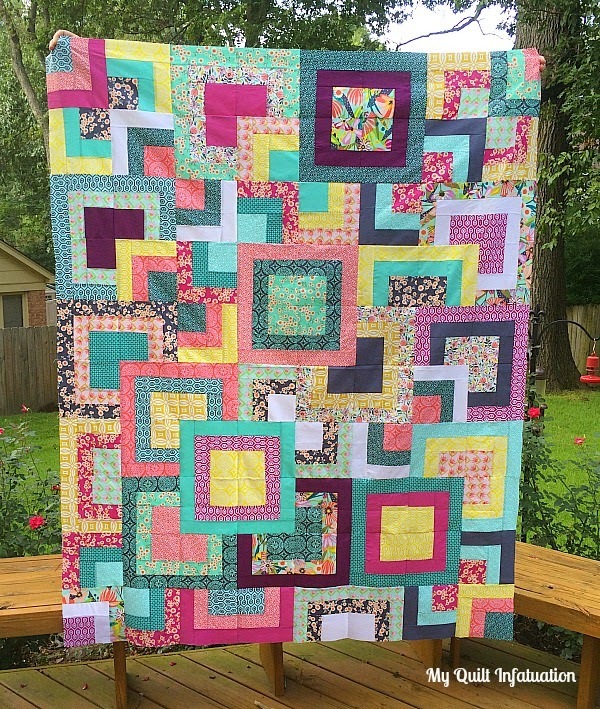 Kelly your modifications make for a wonderful quilt - what a great combination of fabrics! Wow, is that ever fun to look at! I kept seeing different squares each time I looked. I will definitely put that one on my list to try! It looks beautiful! I'm not sure what it is, but these fabrics strike me as very "you" somehow. Any thoughts on how you're going to quilt it? Love the 3D effect of this quilt. Beautiful!!! That's a terrific quilt top, and I love the makin' do aspect. Will you quilt it yourself? Love this quilt top! Beautiful! Oh, I love this pattern! I too thought the pattern called for a lot of fabric. I usually don't buy jelly rolls and a layer cake if the same line. Thanks for the cutting directions!! Wow, I love it! I hadn't seen it before, but I like your version that uses fq's instead. I'll definitely be trying this one! Thank you for your efforts to bring us alternate instructions for using our stash! I hope the pattern makers out there realize that pre-cut patterns need to contain alternate instructions for using your stash! I hesitate to buy pre-cuts because I know I'll still need yardage for borders, bindings, and a back. Pre-cuts are pretty, but not really useful by themselves. Love this quilt; now I really want to try it!!! I don't think I ever saw this pattern before. It's quite lovely! I LOVE that touch of eggplant (dark violet). Can't wait to see this one done! Thanks for making this neat project doable. On August 30, 2013 I downloaded the "recipe", but like others, I didn't have the "ingredients" and noted there was considerable waste even if I did have them. This size is also more to my liking. Love your version. This quilt top is fabulous, Kelly! I love the fabrics that you chose! Thanks so much for sharing your directions for using fat quarters and those cutting diagrams. Love this! Thank you for doing the math for us!!! I've loved this pattern for what feels like forever, but I enjoy mixing up fabric lines too much, and thus have very few precuts. :D Your version is particularly gorgeous! I love your colours in this, and the 3D effect is very creative! I also really like that pattern. It's fun to see it in different colors. And thanks for sharing your math! 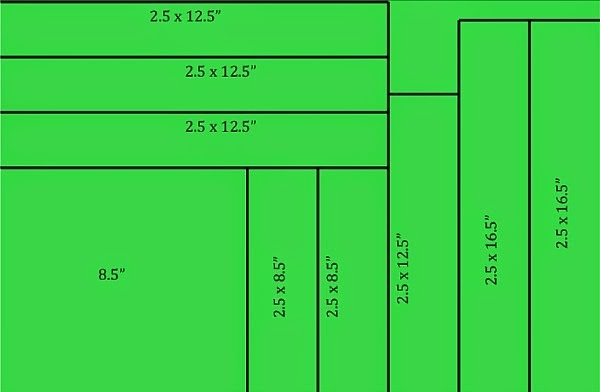 ooohh love it ... thanks for the math and cutting layouts. Scraps here we come! Yes. what they said! I like it alot. I'm adding this quilt to my list. I just realized I used your Easy Peasy Chevron Tutorial! This is beautiful! I like your version even better than the original pattern! This is so cool. Thank you for taking the time to share the cutting instructions for using FQ's. I'm pinning it for "some day". Yours turned out just gorgeous. Fabulous quilt, I love it! I'm still learning how to quilt and this looks a little complex for me, but maybe one day lol! Such a great modification of that pattern. While I like precuts - love anything that de-stashes more. Thanks! Wow!! This is a beautiful quilt. Thank you for doing the "quilt math" for us. I usually use my stash for patterns like this too. Visiting from Sew Many Ways Sunday. Nice bright quilt. Adapting patterns, like adapting recipes, is a good thing. What a fun quilt! It's so visually interesting. Your adaptations are wonderful. Beautiful quilt and a great tutorial! Thank you so much for the new cutting instructions. I can now make this quilt with what ever I have on hand. I have been thinking about stacked squares myself... this will help! I have been trying to make this quilt with yardage and you just solved my problems. I will be making it a king sized quilt in Moda's Black Dress half yard pieces. I think it will be an elegant quilt for our bed. Thank you so much for the instructions on doing this with fabric that I have. I have to go look to see what I do have! Thanks for sharing! I love to collect fat quarters!!! There are not enough LOVE words for this pattern. I have a Secret Stash of fabrics that I love so much that I simply cannot bare to cut them. I have some pieces that are so small people think they are trash. And I put them all in this quilt and VOILA a perfect way to USE AND KEEP my favorites. Thank you so much for this.